Thank goodness the weather today was much improved on last week! We were no longer huddled together like emperor penguins, but were able to enjoy the relatively short walk over Pale Heights , led by Evelyn, instead of Heather , who was not free today. This was a walk well known to most of us, and no less enjoyable for that . I think that we had Christmas preparations to get home to as, surprisingly, we turned down the chance of a coffee in the visitor centre! After a three mile walk, we returned to the cars, looking forward to next Tuesday, when we meet in the Boot Inn for our Christmas lunch. 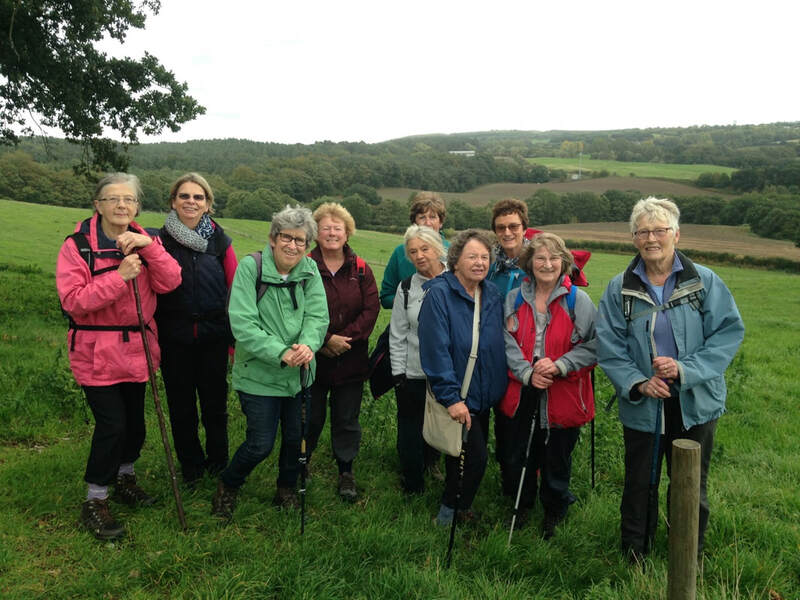 We have now completed out walking programme for 2018, and our next year's programme will be decided at our planning meeting , which will take place at Joan's house on 29th January 2019, at 10.30am. 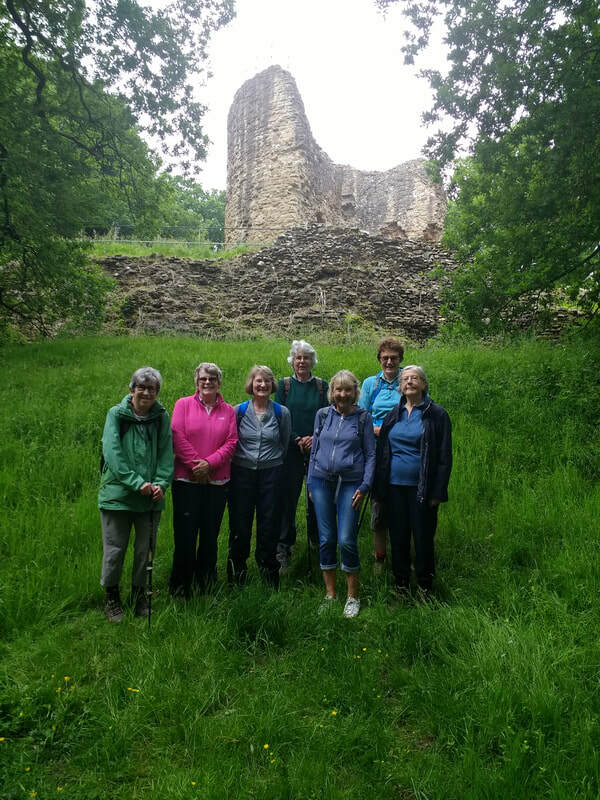 Today was Pat's much anticipated History Tour of Tarporley, a tour which she had put together for the Tarporley History Group , and delivered to them several weeks earlier. There were 16 of us, a very good turnout on what was a bitterly cold day, with a wind which felt as if it was coming straight from Siberia! Pat had put a great deal of work into the tour; she took us from the Utkinton Road end of the High Street, along towards the Catholic Church, across the road past St Helen's Church and the Done Room, ending at the Swan Hotel. Along the way, she gave us the history of most of the significant buildings and business premises, going back several generations, and in some cases, several centuries. We had an extremely interesting morning, but because of the bitter cold, Pat cut the tour slightly short, and we were all extremely glad to arrive at the very cosy Swan Hotel, for our coffee. 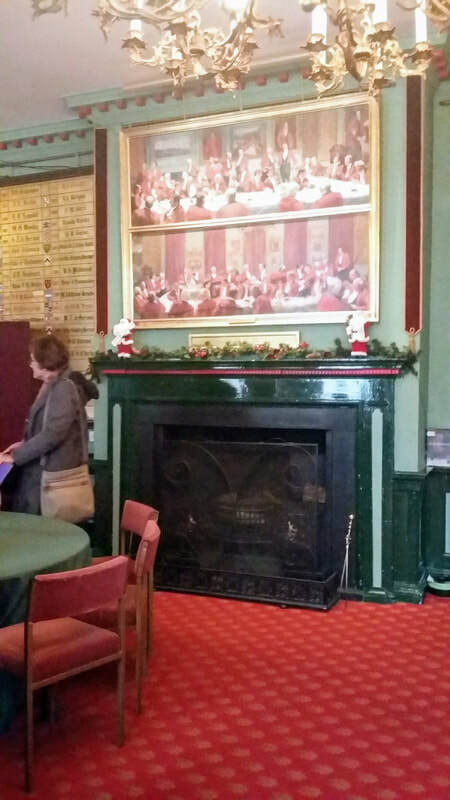 Following the coffee, we were given a tour of the Hunt Room upstairs, which has an extremely interesting history of its own . The Hunt room is pictured below. Today, Fiona led us on a walk from the KCC to Rose Farm Shop. As this was a linear walk, as opposed to our usual circular walk, we organised the cars accordingly, leaving 3 cars at Rose farm for our return journey. We had a lovely walk through the forest on the forest path, then along Tirley Lane into Utkinton. 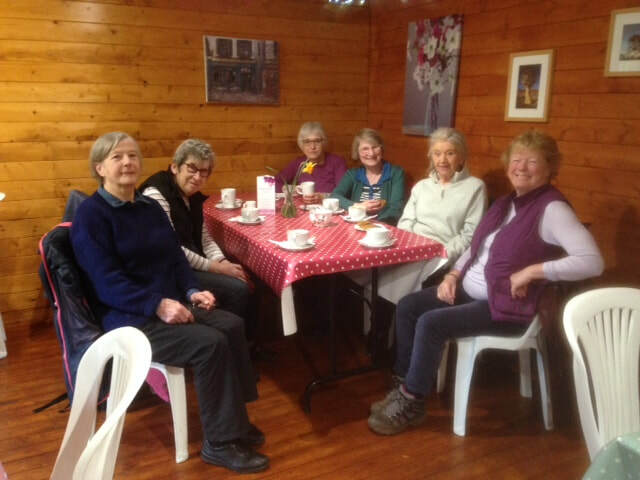 We all enjoyed a coffee or tea in the farm cafe. Before returning to Kelsall, Myra , as co-walking coordinator, was given a small present to thank her, as this was her last walk before Christmas. We enjoyed another lovely November day today when Cathy led us on a walk in and around the pretty village of Lymm . There were fifteen of us on this very enjoyable walk , which included fields, water, a very pretty churchyard , and return via the Bridgwater Canal . Some of us enjoyed a beverage in one of the coffee shops in the village , whilst the others made their way back to the carpark, and home. 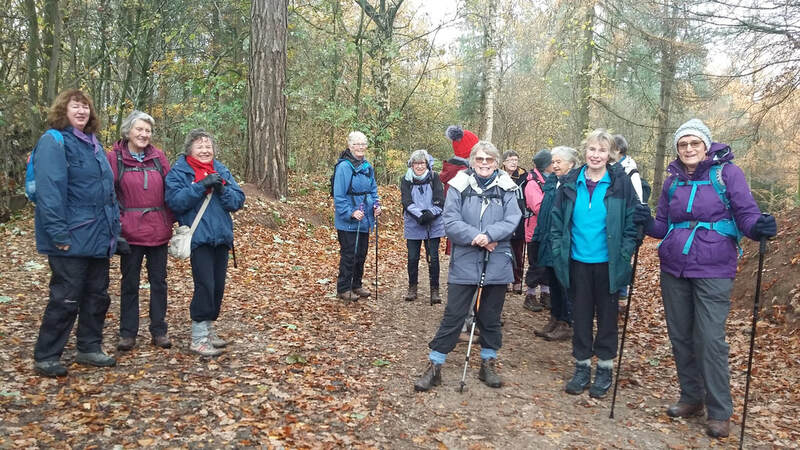 Today,we travelled down to Ellesmere in Shropshire, where Pat led us on a delightful walk, full of Autumn colour. 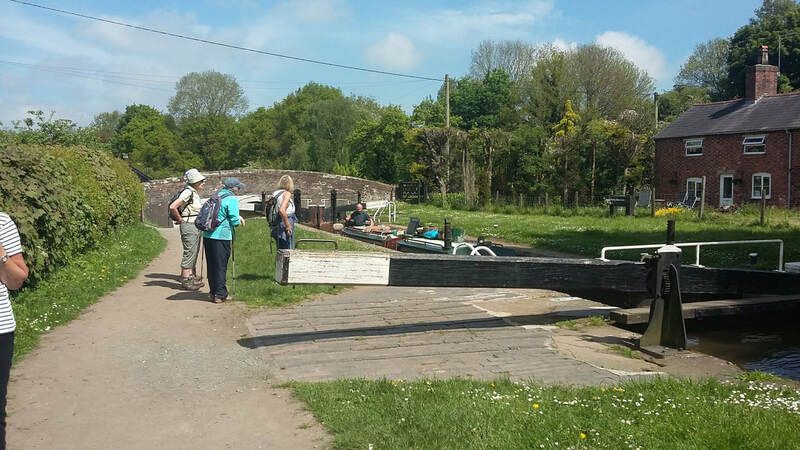 We started at the mere , and continued through fields and along lanes, before arriving at the Shropshire Union canal, which then took us back to the car park. The walk was about six -and-a -half miles in length, and was broken up by a short coffee break, followed by a later lunch break, when we devoured our sandwiches with vigour, amidst the lovely scenery. On returning to the car park, we changed out of our boots, and then headed off to the cafe where we each enjoyed a coffee and cake. It was a long day, but a thoroughly enjoyable one, and the following slide show is proof of that. Our walk today was led by Myra, in the environs of Mouldsworth, a walk taken from a booklet which she had picked up at the Goshawk pub.....Circular Walks from the Goshawk Pub. There were three walk to choose from, one 9 miles in length, one 4miles and one 2miles . We were very glad that she had chosen the 4 mile walk , and not the 9 mile one! We thoroughly enjoyed the very varied walk, parts of which were familiar, but there were so many twist and turns that we commented that it would be very difficult to remember. There were quite a few stiles to negotiate, some quit slippery from previous rain, but fortunately, there was no rain this morning....and no cows! A lovely walk, and as always, a very enjoyable , sociable morning . Today was the turn of Peggy to lead us on a walk, and what a walk it was! Our leader was in her professional capacity this morning, as a Blue Badge Guide, and for at least one of the six of us, this was a new experience . We were shown around the Chester Rows, going into places that can only be seen in the company of an official guide . The first place went into was Pret a Manger, on Northgate street, where, in the basement, are the remains of Roman columns, We were quite amazed to see these, and this set the tone for the rest of the visit. With Peggy leading us , we saw into buildings and viewed the outside of buildings, seeing things that we had never noticed before, looking at Roman and Medieval artefacts , and having a potted history of the Rows. We had a wonderfully interesting morning, and we all came away with increased knowledge of the history of Chester . We were so engrossed in tour that no pictures were taken to accompany this piece! Today, six of us, including 'new girl' Iris, set off into North Wales in order to tackle Moel Famau. It was Cathy's walk, she had checked the forecast, and the weather was due to be better than we had thought. Cathy had done the recce yesterday, and was very hopeful that we would have some good views. Having arrived at the top carpark, we set off up the path with great enthusiasm. We walked up steadily, with the occasional stop to 'admire the view'...aka, to have a rest, and also admire the view! The views were fantastic, and even better when we climbed the structure at the top, where we sat and had our refreshments.....without, surprisingly, being bothered by a force nine gale. 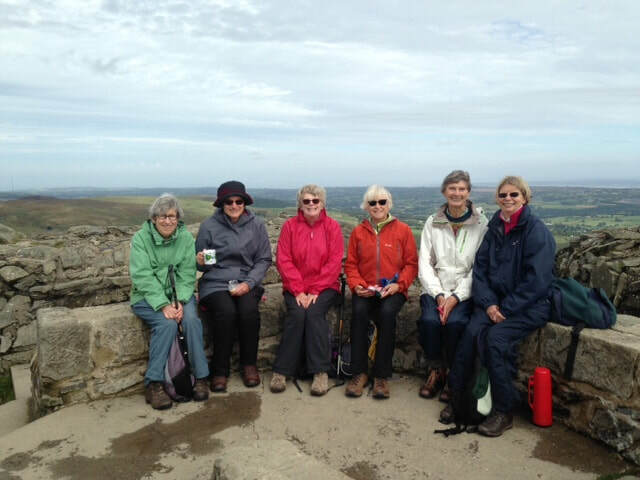 For once , we have a photograph of all the walkers, as we asked one of the other 'climbers' to take the picture. As always appears to be the case, the walk down was a little trickier than the ascent. We all agreed that we had had a fantastic morning, and we calculated that we had walked about four miles, not taking into the account the height! 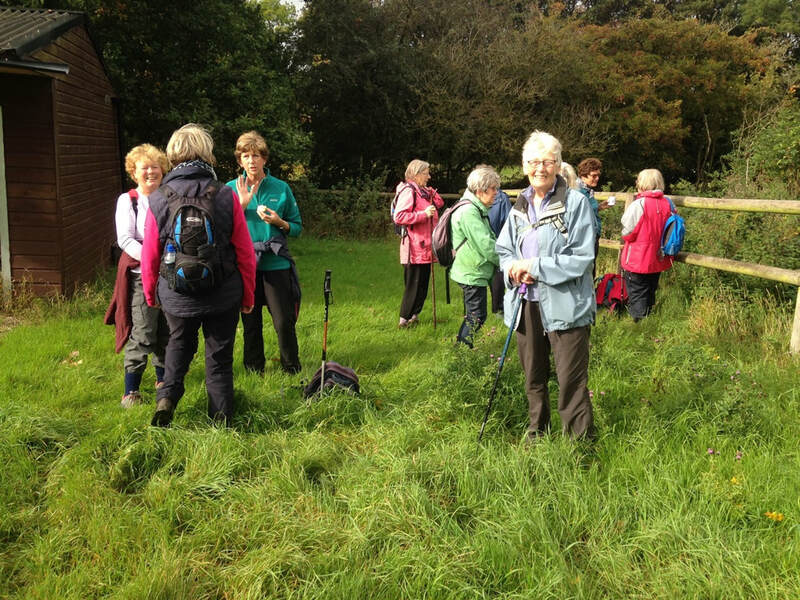 The following photograph was taken on Pat's walk at Wrenbury . What a great turnout we had this morning for Jean's walk! 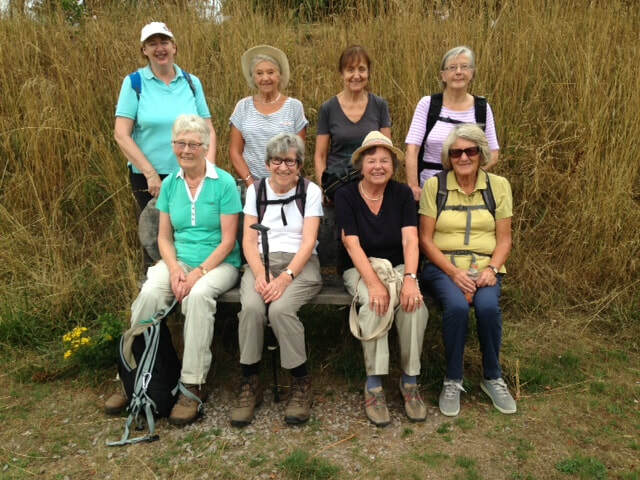 There were fourteen of us , and Jean led us on a lovely varied walk around Little Budworth, starting off from the car park at the rather grandly -named Little Budworth Country Park. 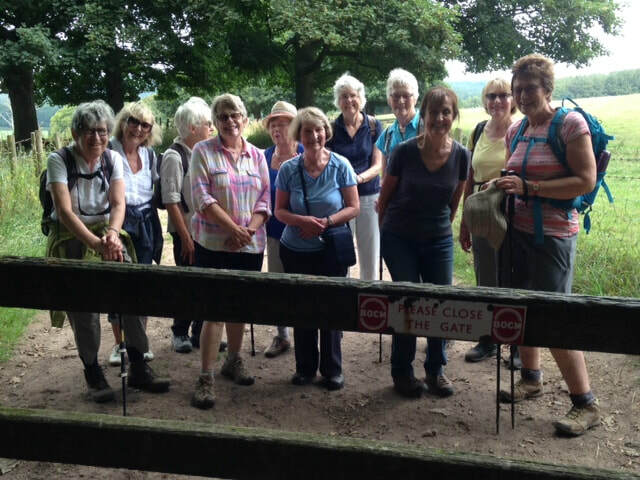 Although we had walked in this area as a group a few times before, Jean led us through some areas that were completely new to some of us , including Budworth Pond, a lovely- looking body of water hidden behind trees. 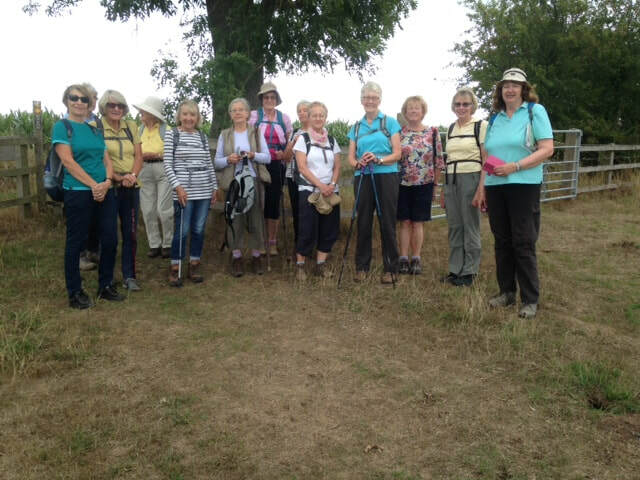 A most enjoyable sociable walk , as always, was had by us all, and Jean was extremely relieved that we hadn't got lost! Today, Anne's planned walk around Peckforton and Beeston had to be postponed due to road closures.... again. We will do this walk later in the year. Instead, we just had a local walk ,up to the stones at the top of Pale Heights, and back via Eddisbury farm . 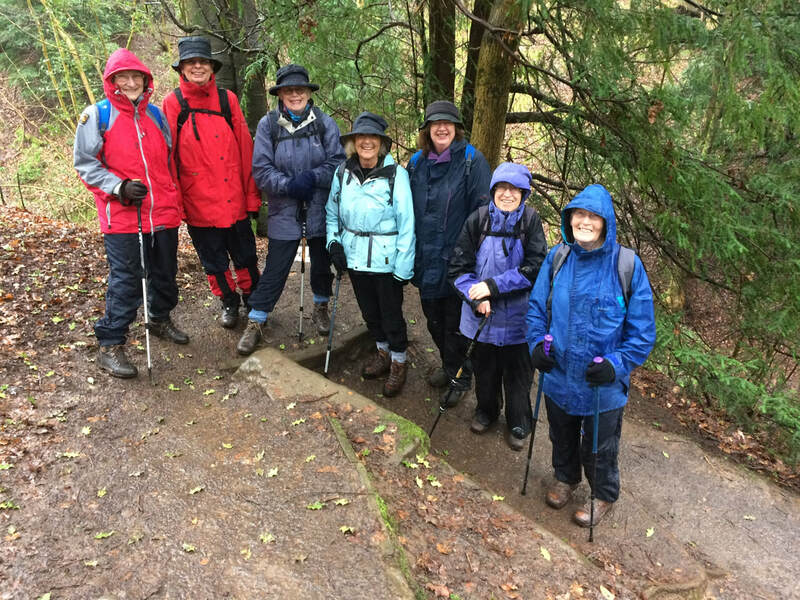 The picture below, taken by Jean, is of the group just before re-entering the forest having come up the incline past the farm. There have been quite a few pictures taken at this spot over the years , but our enthusiasm for our walking is always in evidence. Today , in a change from the planned programme , Evelyn led us on a short walk from Stonyford Cottage Gardens, and back again . We got slightly sidetracked, which involved walking through a ploughed potato field twice , and some of us wished that we had brought some bags with us , as there were masses of tasty -looking small new potatoes on the ground, just waiting to be picked up! A missed opportunity! Following the walk , we stopped for coffee in the coffee shop, where some had cake, and some did not.This is becoming a bit of a habit, but a very pleasant one ! 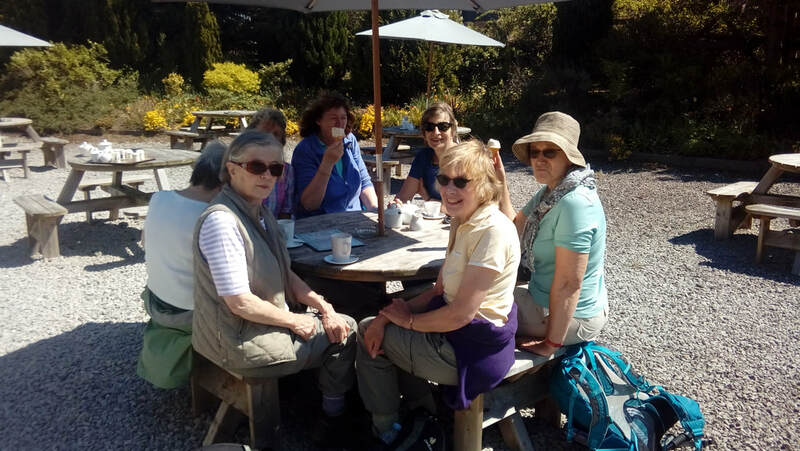 Today, Mary's plan was to lead a walk in the Gowey and Brock Holes area, to be followed by coffee and cake at the home of Marjorie and Les Pritchard. Due to the very hot weather, the walk was shortened and basically linear alongside the canal . It was amazingly cool with shade nearly all the way and a breeze. We dipped down into the Brock holes to admire the canal bridge engineering and returned back to by the Shady oak- which was closed. Marjorie and Les served squash followed by cakes coffee and tea, and fruit salad and ice cream . Quite decadent end to our mini walk. 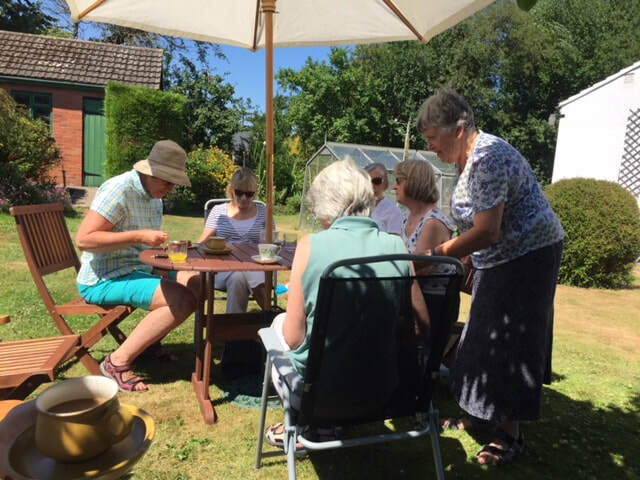 In fact Heather, Pam and Anne H joined for the refreshment only! Margaret started her walk today with a promise of ice cream . We had set off from the car park at the Arley Estate, the sky was deepest blue the mercury was rising , the temperature predicted to be about 29 degrees later on. Imagine our disappointment when we arrived to find the Great Budworth Ice Cream Farm Shop not due to open for another hour or so. Since this was only the beginning of our walk, we refused to be downhearted, and instead, some while later, sat in the shade of the church in the very pretty village of Great Budworth, and ate our "elevenses" there. 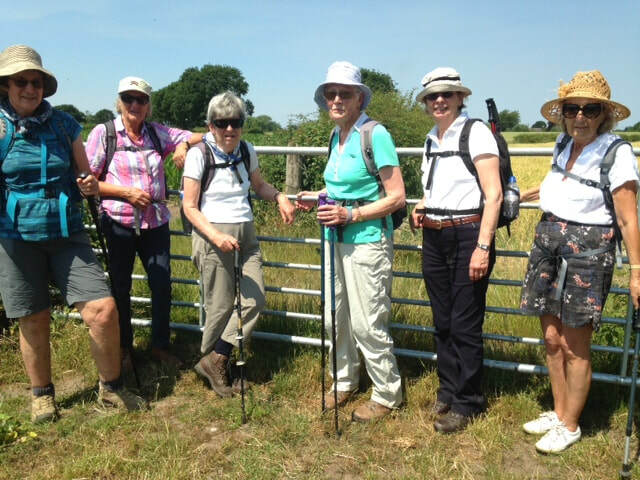 The walk took us mostly across fields , and along lanes in and around the Arley estate, and the temperature continued to soar. Margaret had identified an ideal place for our picnic lunch in the shade of a tree...the only problem was that it was a holly tree , and these dried holly leaves get everywhere!! After our lunch, we continued on our way leaving the shade behind for the next section through fields . Margaret was glad to find that one field, which had been absolutely full of cows when she had done the recce with Glyn, was now cow-free, but later, we entered a field which, having had no cows before, now contained a number of the animals, plus a very large bull.Fortunately, he ignored us, and we continued on our way. We arrived back at the car park after a really enjoyable walk of about six miles in very hot conditions,rather too hot for some of us, and were very glad to be cooled by the air conditioning on the drive home . Another lovely day out! 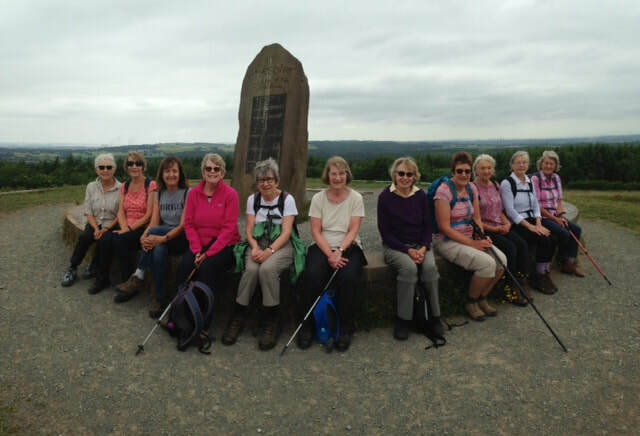 It is quite a while since we have posted a picture of our walking group at the stones at the top of Pale Heights. The time has come for another picture of us at this fantastic landmark, so close to our homes. Our walk today was led by Fiona, her first walk as leader, and she surprised us by choosing paths that some of us have never been on before ! 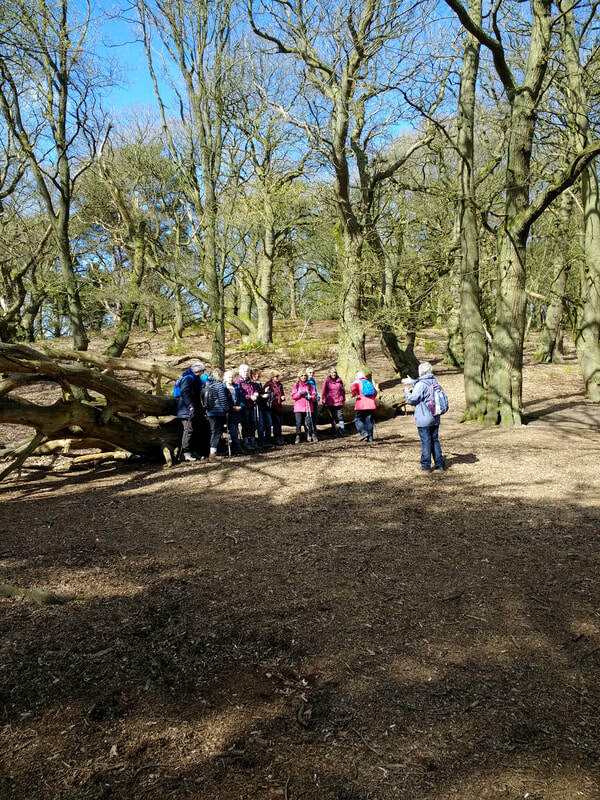 We walked from the KCC carpark, and up Hall Lane, down Forest Gate Lane , and around Delamere Forest , stopping at the visitor centre, just as a coach load of young children were about to pile into the loos! However, we had a welcome stop, drank our drinks and ate our snacks , before walking slowly uphill to the stones where the following picture was taken . We are so very lucky to live so close to such an iconic place ! Thank goodness it didn't rain today! Torrential rain back on the 10th of April had caused Pam's walk to be abandoned...in favour of coffee at the Forest Hills Hotel.... and today was her belated walk, starting at Beacon Hill , near Frodsham , a walk which Pam had done with her family on many occassions in previous years. 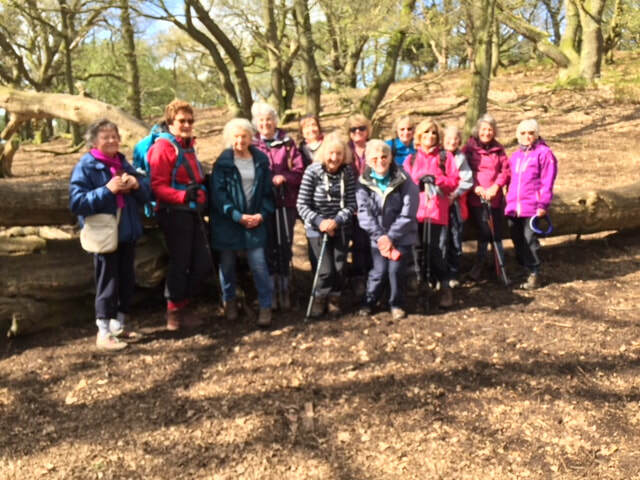 ​ The group today comprised fourteen of us, and the walk took in part of the Sandstone Trail , starting off across the Frodsham Golf Course. Soon, we descended into the deep depression known as Dunsdale Hollow, followed some time later by going up Jacob's Ladder. We all agreed that this would have been impossible in the pouring rain of April 10th! The walk was about three miles in length, but included quite a few "ups and downs' on a variety of steps, some lovely open vistas, and a couple of hundred yards of "jungle trecking", where the ferns had grown above chest height. They had not been there when Pam had done her recce! 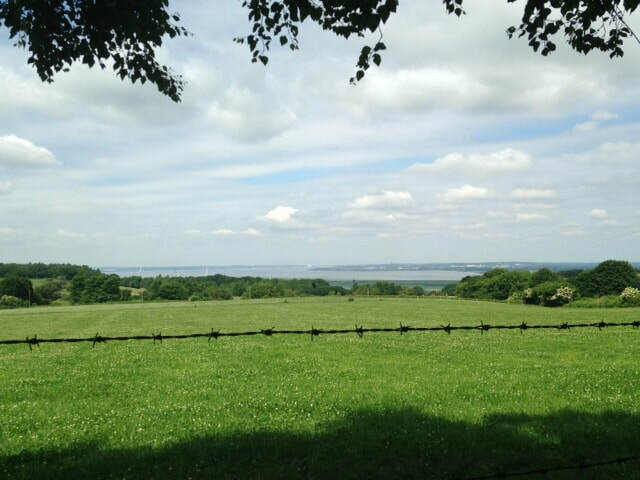 Towards the end, we were rewarded with magnificent views over the Mersey estuary . Once again, our Tuesday morning walk proved extremely enjoyable , and I went home feeling that, although we are not just fair-weather walkers, it is so much better to have a lovely walk in the sunshine rather that the pouring rain. Today, we walked around Wepre Park, in Flintshire, a place that was new to most of us. Heather was our leader today, with seven followers. We started our journey round the park in an anti-clockwise direction, as Heather wanted to keep the best till last. This meant reversing the walk that she had done with John a couple of weeks before, and this caused the the occasional wrong turn, to everyone's amusement. The walk took us through woodland, across fields and along lanes. We passed through Northop, and toward the end of the walk, we encountered Ewloe Castle, where an information board told us that, in July 1157, Henry the Second was almost killed near here in a battle against Owain ap Gruffud . The most attractive part of the walk had indeed been saved until the end,when we walked along the banks of the Wepre stream , in dappled sunshine . ....Another great walk today, with plenty of information along the way , and increasing warmth, which saw most of us shedding layers as we progressed. Today, we ventured into Shropshire for the first time in a while . Our walk was led by Janet, and , having driven to the village of Tushingham , three miles north of Whitchurch, we began our walk at the Bluebell Inn, an ancient half-timbered inn situated on a loop of the old A41 , at the Bell o' th' Hill . The sun was shining and the sky was blue. 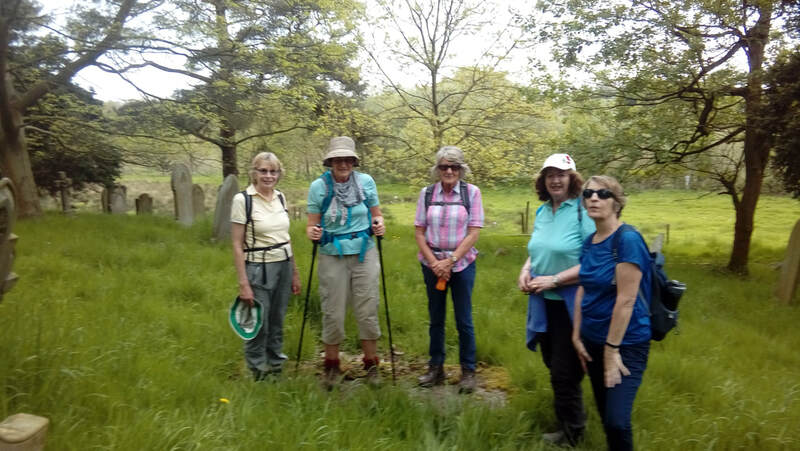 Very shortly, we arrived at the church of Old St Chad's, known to most of us, but new to the newer members of the group, and we spent some time in the church yard looking at the headstones and admiring the trees. The walk continued over fields until we joined the tow path on the Shropshire Union Canal, and another mile and a half further on found us at Gridley Brook Lock. There was a canal boat going through the lock at the time, and , as always, it was the 'lady of the boat' working the gate mechanism, whilst the 'man of the boat' did the "driving". Is it just me who wonders why this is always so?!! Later in the walk, we stopped for a very welcome cold drink or ice cream at the side of the canal,at a well known watering hole on the Sandstone Trail, making our way back along a very quiet county lane. 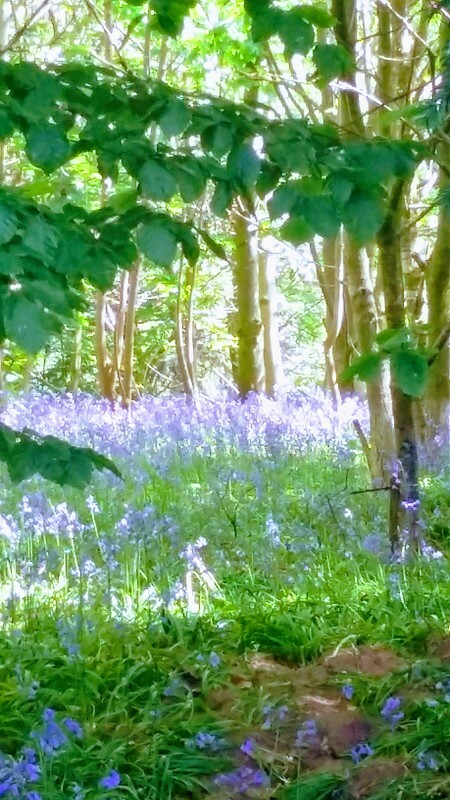 En route , we passed an almost hidden bluebell wood, and the following picture taken by Fiona shows it as its best. A great walk! 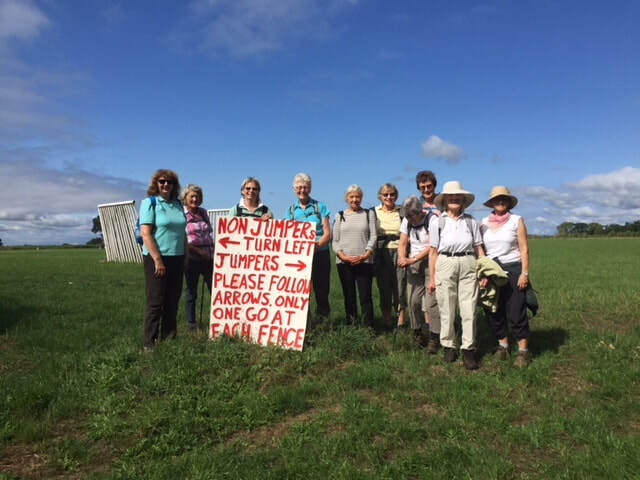 Ice cream, apple pies and traffic jams.... eight intrepid walkers set off for the wilds of Wybunbury on the 8th May. The weather was perfect, hot and sunny although rain was forecast for 3pm. Unfortunately Highways England had failed to forecast the closure of the A51 at Nantwich and so two car-loads of enthusiastic walkers sat in long traffic queues. Once we arrived boots were hurriedly donned and off we set over fields and stiles all the time looking forward to R&R at Dagfields Emporium at the half way point. This was a highlight for some with ice cream cones being compared for size, with some sadly found lacking. Teas and coffees were also enjoyed. For the leader this was a slight worry as some needed encouragement to get a move on and continue the walk. Soon we joined the South Cheshire Way and walked back towards the distinctive leaning Church Tower of Wybunbury. As dark clouds gathered there was time to take a look at the remarkable Wybunbury Moss, a floating skin of peaty vegetation above a deep water filled hollow. This area is rich in rare plants and insects, but sadly the rain started exactly on cue and so it was time to make a dash back home. 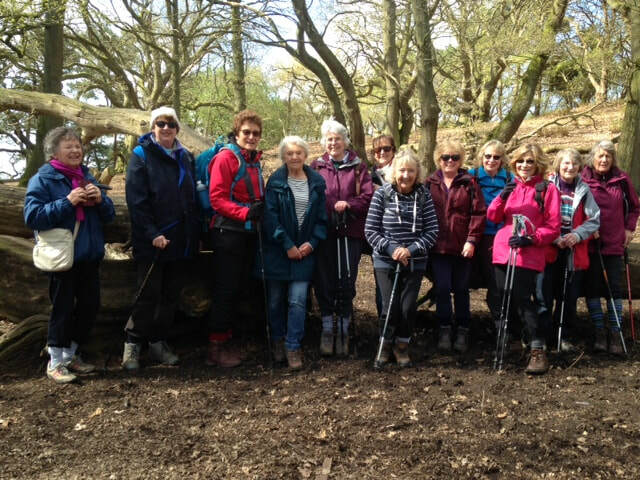 Today's walk was led by Anne , through Bulkeley Wood and around Burwardsley . Anne was having a nostalgic moment, as she told us that , on her very first walk with the WI, in 2005, the group had stopped for their mid-morning snack at the large fallen tree in the middle of the wood. It was decided that we would stop for a photo opportunity at the same tree, although it was a little early to have our snack! Today, the beautiful beech wood looked stunning with the sun shining through the branches, and when walking over the fields, the huge blue sky with the scudding fluffy clouds was equally spectacular. After the dreadful weather of recent weeks, it was a joy to be out in such lovely countryside in the early May warmth, and although it was a walk that most of us knew well , I think that we all enjoyed the walk and felt a great deal better for it . Today's walk was led by Evelyn, setting off from Stonyford cottage garden, with the intention of joining the Whitegate Way. Unfortunately, a very short way into the walk, we encountered a notice informing us that a few of the routes in the area were closed due to upgrading work . We inferred from the notice that it did not involve the paths that Evelyn had planned, but a short distance ahead, it became clear that we could go no further! Evelyn quickly changed her plan, we retraced our steps, and walked a different route passing the Forest View pub . 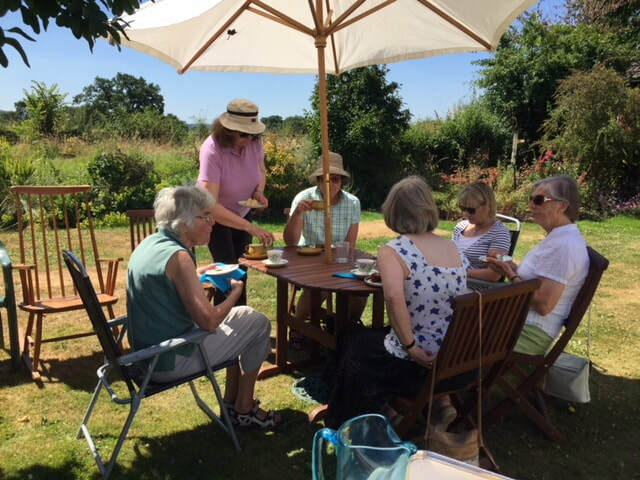 We walked a good distance along the lanes , returning the same way, finishing up once again at the Stonyford Cottage Garden, where we enjoyed a welcome coffee, and some of us, a piece of cake. This seems to be becoming a habit these days! On consulting her walking App , Evelyn informed us that we had walked about 5 miles, which was longer than her originally planned three miles. Those of us who had indulged in a little bit of cake felt all the better for having walked that little bit further! 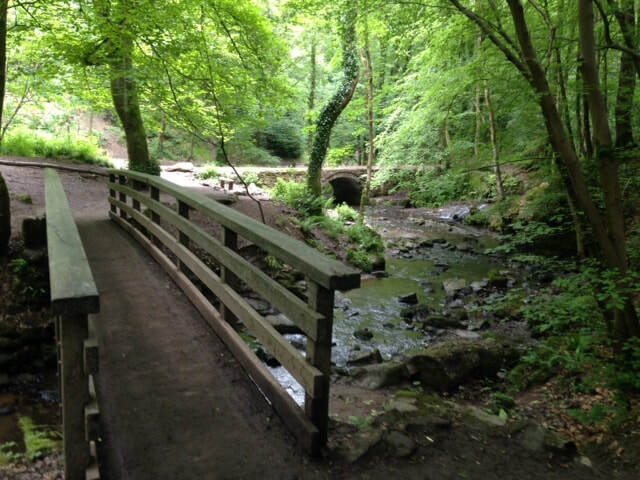 Today , our walk was led by Pat, and it was in the grounds of Quarry Bank Mill , near Styall. There were eight of us , and we knew that we were in for quite a damp walk as we set off in the rain. However, it is said, changing the words slightly, that there is no such thing as a wet walk, only inappropriate clothing, and as the picture shows, we were all appropriately clothed! The picture shows us shortly after the beginning of the walk, but we remained as cheerful throughout. The first part of the walk was through wooded areas, along muddy paths, and up and down flights of steps , some easier than others. We crossed the River Bollin at least twice, and it was running very fast in places. There was a lot of wild garlic in evidence, not yet flowering , but soon to be a carpet of green and white. Towards the end of the walk, we walked directly past the boundary fence of Manchester airport, and three flights took off as we went by...the first was a Cathay Pacific flight, and the second was an EasyJet plane. We could not help wondeering about their destinations . Our own destination was not too far ahead by now, and after walking though Styall Village, we stopped briefly outside Quarry Bank Mill . Just at that moment, the sun came out and blue sky appeared for the first time in the day, allowing us to dry off a little before returning to our cars. Pat calculated that we had walked about four and a half miles , but this did not include all the distances up and down . However, in spite of the weather, we had a really enjoyable walk, but we knew that our boots would need a good clean when we got home. 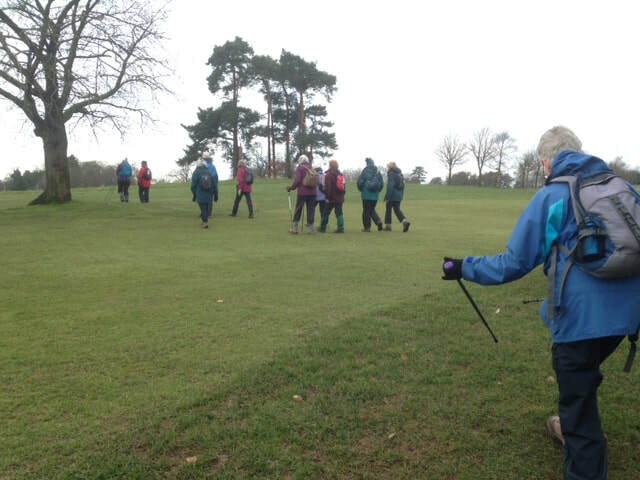 Today was Margaret's walk, a walk around Tarporley Golf Course of about four miles in length. Having met at the KCC as usual, we set off towards Tarporley and parked our cars in Heath Green , a lane that was new to quite a few of us . The walk took us through the village of Eaton, and then across the golf course down into Tarporley, where we decided not to inflict our muddy boots onto any of the coffee venues! We walked back across the golf course, where there were very few golfers in evidence , before returning to our cars . A very pleasant and sociable walk...but we are all looking forward to a little bit of sunshine . Roll on Spring ! Today's walk was the second of the new season, the first having taken place last week. 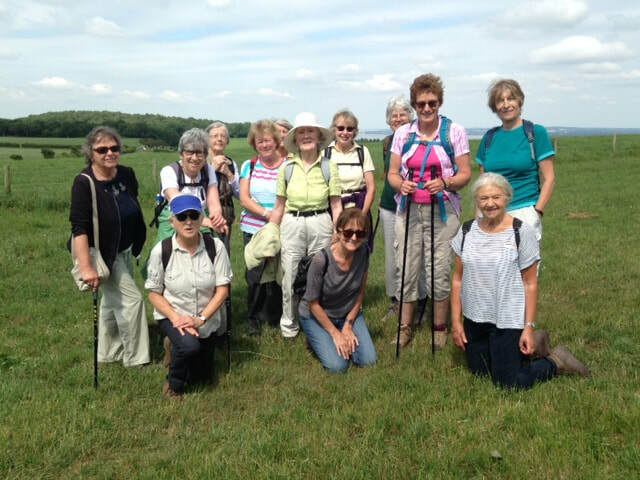 Last week's was the Village Safari, led by Myra, following Evelyn's route, as she was unable to do it. 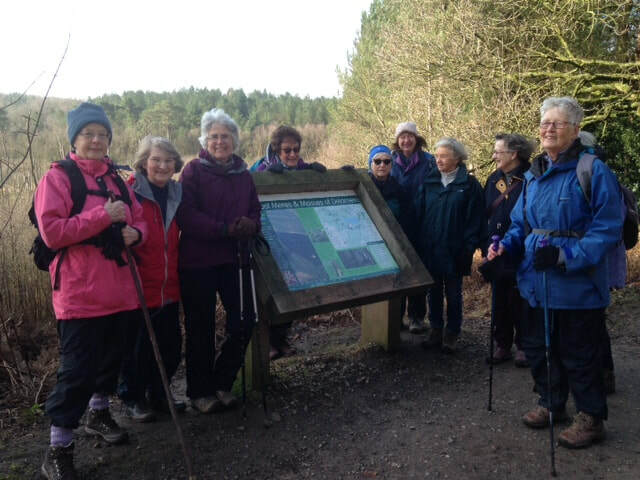 Our walk today was led by Cathy, around Delamere Forest, starting from the Barnsbridge Gate car park , or should I say ... near there! The car park was completely full, with cars coming in and out trying to find a space. Cars were parked all along the muddy roadside , and eventually, our three drivers were successful . Why so busy... ? It was half term, of course, and the world and his wife ( and children and dogs) had descended on Delamere Forest! It was a beautiful day, the sun was shining, the birds were singing , and we could feel that Spring was just round the corner. Anyone who had wished to have a quiet solitary walk would perhaps have been disappointed , but despite the crowds, we had a thoroughly enjoyable walk of about four miles, ending with a welcome coffee at the Visitor Centre.